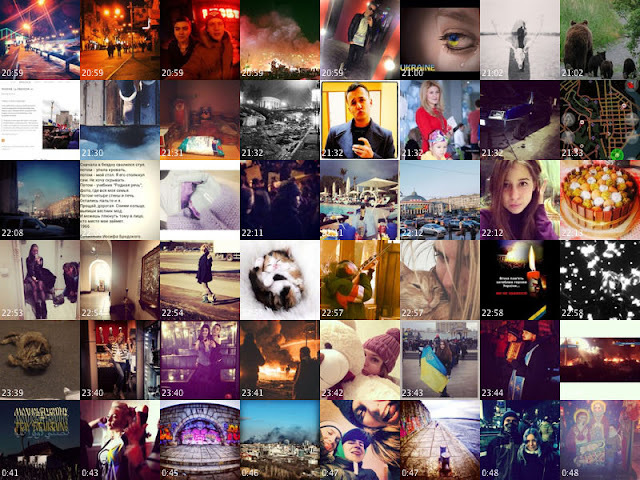 A selection from all Instagram images publically shared in the central part of Kiev in the evening of February 18, 2014. Last Fall we published a research project The Exceptional and the Everyday: 144 hours in Kyiv. This was the first project to analyze use of Instagram during a social upheaval. We used computational and visualization techniques to analyze over 13,000 Instagram images shared by people in Kyiv during one week of the Euromaidan Revolution in February 2014. This revolution took place exactly one year ago - but it is not over yet. Immediately after the success of revolution events in February 2014, Russia sent its troops to annex Crimea, and later to support separatists in Eastern Ukraine. Russian military intervention in Ukraine continues, despite all international efforts to stop it. The essay is written by Dr. Svitlana Matviyenko. Born in Ukraine, she became the most interesting young literary critic in Kyiv. Currently she is completing her second PhD and teaching at the University of Western Ontario (Canada). While we worked on the project last year, we asked Svitlana to help us understand the use of Ukrainian tags in our Instagram dataset, given her connections in Kyiv and understanding of Maidan movements. Her insights were so interesting that we asked her to develop a longer text. The essay she wrote is very interesting and original - you must read it if you are interested in social movements, use of social media, contemporary media theory or events in Ukraine. We produced a few new data visualizations specifically for Svitlana, and I am happy to see that she put them to good use in her essay.